Satya Narayan Sahu, 40, has just booked a two-bedroom apartment for ₹ 58 lakh in the Dream Acres project in suburban Bengaluru’s Balagere area, in what is going to be realty firm Sobha Ltd’s first project in the affordable category. In a bid to grab a larger customer share, Sobha, which typically builds homes with a price tag of ₹ 1 crore and upwards, recently ventured into a new segment of homes, which cost ₹ 35-75 lakh. The timing couldn’t have been more apt. Home sales are tepid in most cities and developers are trying hard to come out of their comfort zones and woo different segments of buyers to pump up sales. For Sahu, an information technology professional, the reason to buy the 1,000 sq. ft apartment was quite simple. “The project is priced better than most other projects in the vicinity, which are about 10-15% higher and the location, between two arterial roads, is well connected. Besides, this was a Sobha project, which typically sells at a premium to most other developers," he said. Over the last few weeks, buyers have lapped up the one- and two-bedroom apartments in Sobha’s newly launched Bengaluru project. “We wanted to create a product that would be for the aspirational buyer and yet will become a part and parcel of Sobha. The Dream series of homes helps us grow our volumes and maintain margins," said J.C. Sharma, vice-chairman and managing director, Sobha. 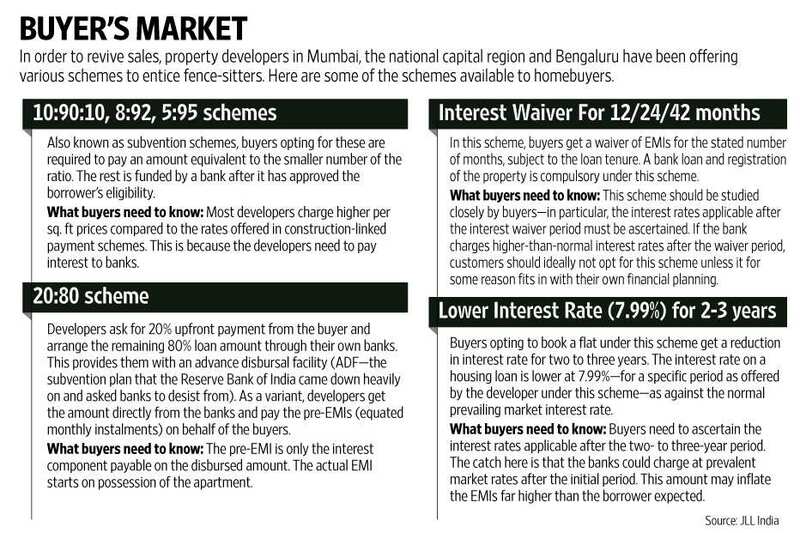 Notwithstanding a prolonged real estate slowdown, homebuyers who have been fence-sitting for a long time can finally take the plunge as easy payment schemes, upfront discounts and lower-priced projects flood the market. In what is being termed a buyer’s market, customers can negotiate prices with developers in large property markets such as Mumbai, the national capital region (NCR) and Bengaluru, where inventory pile-up is high and sales comparatively slow. “This is a good time to buy because the market is slow and prices are competitive. What developers are offering has not been seen for quite some time. If you are an end-user, you can get a good deal now," said Anshuman Magazine, chairman and managing director of CBRE South Asia Pvt. Ltd, a property advisory. Not just discounts, but the flexibility that some payment schemes offer a buyer are unprecedented in Indian real estate (see chart). As a result, homebuyers can now upgrade to larger homes and even expand their budget. The 20:80 scheme, for instance, lets the buyer pay only 20% of the amount upfront and the developer, in some cases, pays the pre-EMI (equated monthly instalment) interest on the loan taken by the buyer for the rest, offering relief to those waiting for an under-construction project to get ready. “We have used the 20:80 scheme in some of our projects and the response has been good," said Gaurav Gupta, director at Mumbai-based Omkar Realtors and Developers Pvt. Ltd.
Gupta said the scheme has helped sell properties in the luxury segment, where the worry is whether the developer will be able to deliver on time and where delays are usually expected. “With this scheme, the builder says 80% of the risk is on me and if there is a delay, I will bear the pain," Gupta said. Being a buyer’s market, it is possible to sit across the table and get the best price possible in a project of one’s choice. Deals can include direct discounts on the sticker price from the developer, waiving of parking charges and even some of the charges for other amenities. Parking charge for an apartment is typically between ₹ 4-5 lakh. A buyer also has the option of asking the developer to improve his home by providing better flooring or throwing in a modular kitchen for free. Unsold inventory levels are high in both the NCR and Mumbai, with the former bogged down by huge supply and deep dependence on investors and the latter crippled by its unaffordable property prices. “Most developers need to liquidate quickly and are a little flexible now, after waiting for nearly two years," said Ashwinder Raj Singh, chief executive officer (residential) at property advisory JLL India. However, price can’t be the only deciding factor while buying a home, said Lovaii Navlakhi, a Bengaluru-based financial planner. “Our home investment horizon is of a long duration and there are other important factors such as location, project amenities, convenience and accessibility one needs to consider. As a buyer, one should ask if one is paying the right price for all these factors as well," said Navlakhi. A slow market is an investor’s nightmare, but it may be a dream come true for actual home buyers. Buyers can scout for apartments that are backed by investors who are in a rush to exit, even at a discount, having waited for more than three years. These apartments are available at reasonable discounts to what a project developer is selling at. Concerns remain, though, when buying in a slow market scenario. Project delays are rampant and many developers are struggling to finish projects, as cash flows dry up due to weak sales. “It is a good idea to buy when every project is being sold through some scheme or the other. But eventually, steady cash flows need to come in for timely completion and delivery of projects," said Balaji Raghavan, director, IIFL Realty Ltd, a subsidiary of IIFL Group.